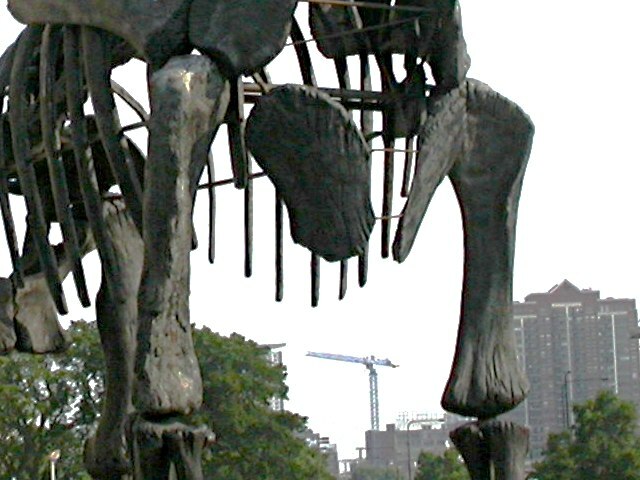 All 2 (two) of my Chicago museum mounted Brachiosaurus pics are also ‘art’ rather than science; in one, the big lump is staring pensively out across the Chicago downtown skyline… You can (just) see the differences between humeri, and also the relative gracility of femur vs hunerus – though given the perspective and orientation I don’t think it’s too helpful. I think I only took 2 pics because I had to jump a fence and walk on a lawn to get the perspective I wanted and was frowned at by a guard, so I quickly went back into the museum to look at the teeth of smaller beasts in the collections! These differences in the cast humeri, and the possible errors with the Giraffatitian femur:humerus circumference measurements, drive home that you really do need to be very careful with the measurements when extrapolating mass from just 2 datapoints, in comparison to the volumetric methods where it’s the ‘fatness’ and pneumatisation parameters that seem to have most effect but individual bone measures in the initial scanning likely have limited effect on final mass estimates. And the taxa in Benson et al 2014 where only one circumference is known, and the other estimated from either two or even only one width (ant-post vs medial-lateral) measurements are potentially even more shaky. I’ll read Remes et al. later today to see if humeri and femurs are all from the same individual and all real in the current Berlin Giraffatitan mount. Absolutely agreed (needless to say) — mass estimates based on a single measurement of a single bone are pretty terrifying. Finally — Janensch covered in detail what was and wasn’t real in the Berlin, and which specimens/quarries the various non-S II elements were from. The new mount uses exactly the same fossil material (with some new and much better sculptures) so everything he wrote in 1950 still pertains. 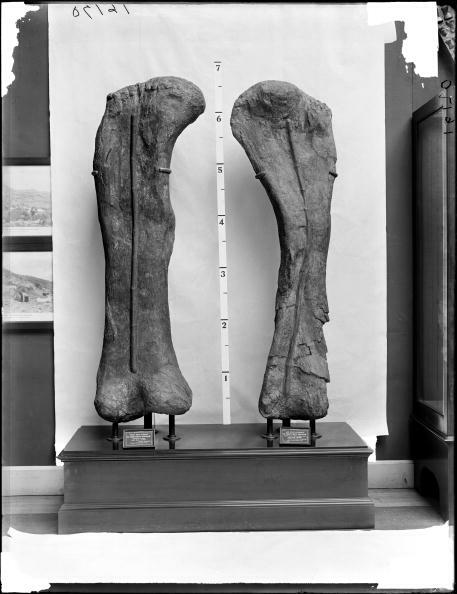 I suspect the humerus and femur in the old field museum photo were indeed casts, because it looks like they should have holes drilled into their distal ends to accommodate the three posts there and still be able to stand up straight. The real humerus lying in the plaster jacket doesn’t have any holes at the bottom end, doesn’t appear to be tampered with by drills. Not having seen most original specimens in person, I wonder how many of the early mounts actually had drilled bones, and how many used casts. Based on photos of older mounts in various museums, I don’t see much evidence of original fossils being mutilated like that, although Jack Horner in “The complete T. rex” implied that it happened a lot and that’s why he doesn’t like mounted skeletons in general. The old mounts weren’t as advanced as the new RCI ones, but did they really damage the original fossils in order to mount them? 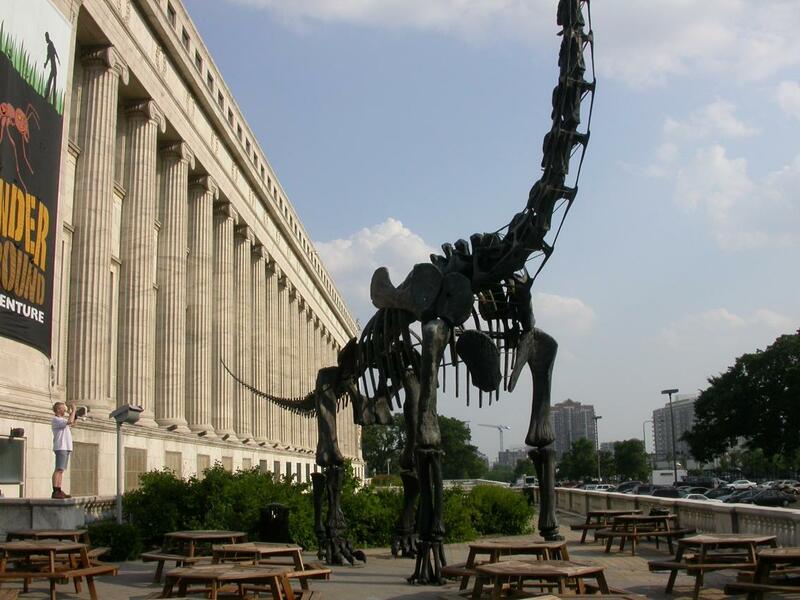 I think you have a good point, Nima — I wonder if anyone from the Field Museum can comment? On the more general question of how often bones were mutilated for mounting: I don’t know how common it was, but it did happen for sure. 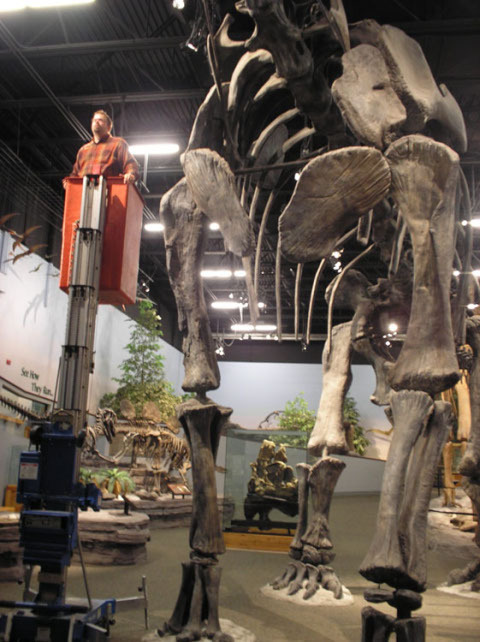 They did all sorts of stuff to the Brontosaurus holotype YPM 1980. 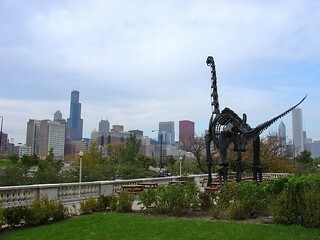 According to this quintessentially 90s Chicago Tribune article, the Brachiosaurus mount was the work of Gillis Danis of Prehistoric Animal Structures, Inc in 1993. Im also pretty sure Triebold Paleontology sells casts if the mount, so it might be worth getting in touch with them? Remes et al 2013 openly admit that Janensch 1950 covered everything in detail, but state that they hope to make it more freely available (by which I guess they mean not in German and in a book, though that’s possibly less available than the original if that is now available as PDF!). My German’s rusty and I had the book on the shelf right above my desk so I didn’t even have to get up to grab it! They note that both mounted Giraffatitan humeri are original bone from SII, but that the left femur is a partial SII bone completed with plaster, and the right is bone but from the Tendaguru site ‘Ni’ so presumably not SII. I don’t know about the old photo, but I don’t think the humerus is in a field jacket, I think it’s just lying on a collections jacket to support it so it won’t break – seeing the other side should be no more difficult than getting out a whole mess of bean bags or other padding and rolling it over. I may know someone I can ask to confirm it, but that’s a common practice. On that last one ignore the pelvis (which is just sitting on the cement) and gaze in horror at the vertebrae on the lower right of the image. And yes, those are the real bones. Yes Matt, those are the real bones from the “Seismosaurus” specimen, and they are embedded to greater and lesser degrees in a cement-based faux rock display. Dave Lovelace went down there to photograph the specimen so we could check the coding and they were already like that over a decade ago. Scott: you have brought new sadness into my life. How how how could this have happened? Ian, a very good English translation of Janensch (1950b) is freely available on the Polyglot Paleontologist site. I’m glad to see that the Remes et al. account corrects an error Janensch which I pointed out in 2009 paper (p.799) — he reversed which femur was partial one from S II and which was a complete (and slightly smaller) one from Ni. If the plaster reconstruction was redone (which seems unlikely) I’m sure Remes et al. would have mentioned it. The same thing happened to the Sinraptor and Monolophosaurus holotypes, so that when Brusatte et al. (2010) and Zhao et al. 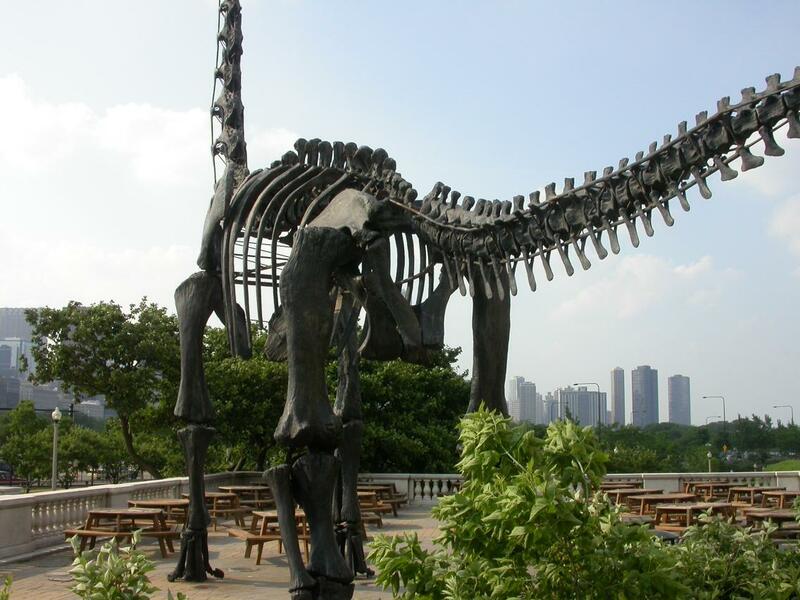 (2010) redescribed the latter, one half of the skeleton was inaccessable. If the IVPP’s not going to remove the mess for Currie, Zhao, Brusatte and Benson, who WILL be the ones to have access to the whole fossil? So what DID happen to it? Broken up for gravel? Shot out of a cannon? Thanks for the info Mike, that probably is more accessible than the Remes chapter in the sauropod book in that case. If the Ni femur is slightly smaller, and was measure in for the Campione & Evans 2012 paper, that would explain the low FC:HC ratio. Do you know what the condition of the SII femur is, would you be able to get a reliable minimum circumference measure from complete bone rather than damaged bone (under sized) or partially/wholly plaster (potentially undersized or oversized)?